The train ride to Rome was easily the worst train-ride experience during this trip. The overnight was crowded and I didn't have a reservation because I had the Global Pass.They said I could just board the train and find any seats available if I had the Global Pass. Of course, I could also make a reservation to guarantee seats but it will cost a fair bit. I wanted to save money on the train tickets since I had paid a lot of money for the Global Pass. The thing was that there were many stops along the way. When I first got onto the train in Venice, there were seats. And I made myself comfortable. Note that the time was around midnight. The train stopped at the next station in the next 10-15mins and many people came on board. And a man came in and told me that I was sitting at his place that he had reserved. By this time, most of the "unreserved seats" were already taken and even the narrow corridor outside the cabins were full of people! I had no choice but to move. I went to the corridor and found myself a little place that had a "pull down seat" and I sat at the corridor and tried to sleep. Just so that you know, the train's condition wasn't that good as it was old and dirty. To make matters worse, there was a group of guys who were sitting at the corridor and they were very irritated with people walking pass them and knocking into them. You must understand that the corridor is already very narrow and when you sit at the corridor, people are bound to bump into you as they pass. There was one particular guy who couldn't take it when someone knock his glasses off and he shouted and banged his fist onto the train window! Wow! That was right in front of me! He was really furious. Scary. Everyone was tired. I quickly walked pass him, doing my best not to even have any contact with him and sat down. Awhile later, this group of guys left. Whew.... I wouldn't want to be around them for fear of indirectly provoking them. Managed to catch some sleep. At least, I didn't have to be worried when people were walking along the corridor. It wasn't a good night. About 8am. Arrived in one of the oldest cities in the World - Rome. I was just happy to get out of the train. I quickly walked to the hostel hoping that I could rest a while more before heading out to explore the city. I was surprised at how small the hostel was. Took some time to rest at the narrow walkway between the room and the toilet. It was in that narrow walkway that I used my laptop to update my blog. It was really narrow. Hey, 2 times I was stuck in a narrow place in less than 12 hours! Simply don't understand. When you are in Rome, the first place to visit is none other than the most impressive building of the Roman Empire - The Colosseum. The Colosseum was capable of seating 50,000 spectators and was used for bloody Gladiator contests, among other violent events. That was a form of entertainment for the Romans. The construction of the Colosseum started in 72 AD and competed in 80 AD. That was almost 2000 years ago! Went to Palatine Hill and to the Roman Forum. 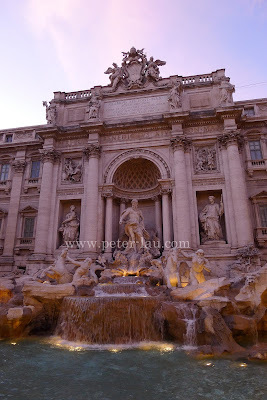 In the evening, I went to the largest Baroque fountain in the city and one of the most famous fountains in the world - Trevi Fountain. A traditional legend holds that if visitors throw a coin into the fountain, they are ensured a return to Rome. And the coin must be thrown with one's right hand over one's left shoulder into the Trevi Fountain. So that was what I did!!! I met an interesting German family when I was there at the fountain. Spoke to them for quite a while and it was funny talking them. You just have to wait to see the video! Woke up early and went to the smallest state in the world - Vatican City. St Peter's Basilica is a must-see when you are in Rome. The dome was designed by Michelangelo but he did not managed to compete it before he passed away. The interior of the Basilica is nothing short of amazing. The next must-see place is the Vatican Museums. I was most impressed with the Gallery of Maps and the Sistine Chapel. The Sistine Chapel is the most crowded place in the Vatican Museums. It is best known for Michelangelo's painting on the chapel's ceiling. Do you see the iconic image of the Hand of God giving life to Adam? Click on the picture to enlarge. I wonder how the artists painted against gravity on the ceiling. No easy feat! After I left Sistine Chapel, I wanted to go to the Pantheon. But Rome was on strike!!! Well, the Metro in Rome, at least. Fortunately, it was only the Metro that was on strike. All the stations were closed and the trains were not running. But the trams and buses were in operation! I didn't know which tram would bring me to the Pantheon so I just hopped into the first one that came my way! Only on the tram I began to ask people how to get there! I just wanted to get out of that area. And I managed to go to a tram stop that was walking distance to the Pantheon. That was good huh? It saved me a lot of time compared to walking all the way from the Vatican. Went back to my hostel and got ready to go to my next destination - Milan, Italy! After visiting the land of the Gladiators, MY LIFE, WAS NEVER, EEEEEEEEEEE...........................EEEE............................EEVER, THE SAME, AGAIN!! !